I don’t know if most of you realize it, but the Baby Boomers are getting out of the workforce at record rates. Just who will take these guys’ places? Are there members within your personnel with the ability to step directly into those shoes? Are they qualified to undertake this transition? Are you? Or is your management team going to have to go look for your next group of leaders? So many questions! There’s an open window here and so many things to consider. As the economy continues to grow, this is a question that must be addressed—the sooner the better. Has your organization thought about a succession plan? The problem that most organizations are facing is that the trouble will be at multiple levels of the organization—from top and middle management, continuing through skilled workers and all the way down to near the bottom of the staff. The coming purge will effect professionals, skilled and semi-skilled workers. The Baby Boomers are at every level of companies out there. Adding to this trouble is the level of unemployment existing in most of the country. As low as it is, it’s very likely that a great deal of those on the unemployed list are the un-employable. One also hears of the great number of those who have just stopped looking for work. This may be true but a great deal of those people are of the Baby Boomer age who lost their employment during the recession and now have qualified for retirement and are no longer looking for work. I had this same experience several years ago here in my area. I had been used to gathering some 300+ resumes after advertising a position. All of a sudden, the unemployment level had dropped to around 2% and I was getting less than 10 resumes; sometimes as few as two. And, worst of all, none of the candidates were qualified. We may be approaching that low watermark once again; especially with talent level and skills. Incidentally, the article revealed a New Hampshire unemployment rate of 2.8%. Additionally, the state projects a need to fill 80% of the production jobs available over the next decade. Yes, just what is the answer? The Governor of New Hampshire, Maggie Hassan, is on the right path. She’s created a Manufacturing Sector Partnership. The initiative connects educators with the organizations that need help. Other companies have gone out on their own and sought out their needs, even offering incentives to bring on board the skills they seek. What these guys are doing are good answers, but what about your own back yard? I would propose that when you are looking for candidates to step into supervisory roles that you first look internally. Your organization just might have the resources to fill leadership roles walking around your own facility and not even know it. Often the case is that skills have been acquired over years and years of observing those leading them without the learning individual even knowing they possess the desired knowledge. Of course, an internal fill does not necessarily solve the overall problem. Worst of all, you set off a cascade of fills and back-fills that seems to be never ending until such time as you hire from the outside the guy//gal that stops the upward or lateral movement of personnel. How do you identify candidates for leadership positions from within? That’s often easier than one might think. It’s nothing more than simply discussing the situations that take place on a daily basis. Routine staff meetings are a real good place to start. Reviewing production, practices, procedures and goals is a good way to learn what’s known throughout the organization. Members of the management team should be noting these skills and ideas of those reporting to them as a routine practice (warehousing the data)—how else could they be collecting information for annual reviews and like requirements. Discussions held during meetings should involve as many team members as possible and solicit ideas for all. Sometimes it’s that quiet guy over in the corner that has a good idea, but isn’t ready yet to share it. Draw it out of them; and in the meantime you just might be building a bit of confidence that will pay off later—like in the situation we are discussing today. 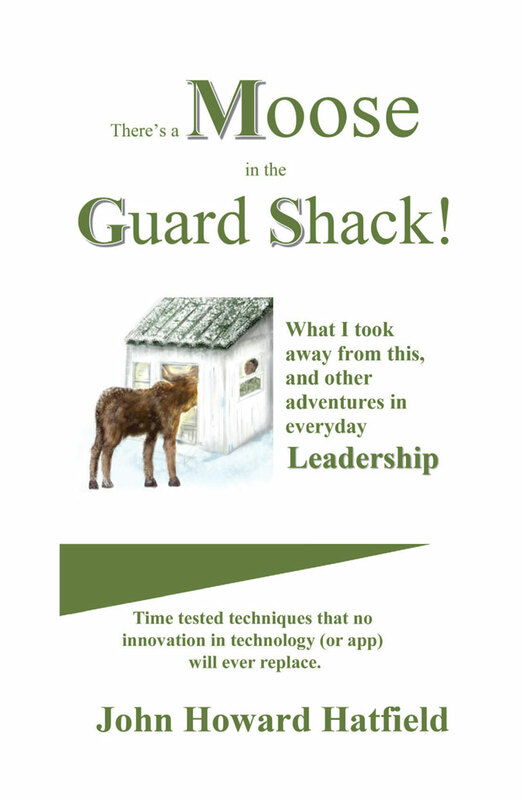 When I first started writing my book “There’s a Moose in the Guard Shack”, I had two specific goals in mind. My first intention was to document stories that my family had never heard that concerned some of the situations that had taken place to and around me during my days specifically in the military and subsequently in my manufacturing assignments. My secondary intention was to document situations and solutions that I could pass on to others to assist them in becoming better leaders and managers without having to experience the frustrations I had experienced in trying to better myself as a leader. I knew the Baby Boomer exodus was just around the corner. In this light, my book, even through all the changes it underwent over the several years I worked on it, these two basic goals remained intact. The stories are there for the family, especially the generations that have followed me. And, the lessons I learned are there in somewhat of a logical text form. Also included is an appendix (D – Review of Lessons Learned) which provides a detailed breakout of the lessons I took away from my experiences in a handy format that works well as a lesson plan for the conduct of training on those take-aways. You can also see this section on the About the Book tab on this website just following the book cover about a third of the way down the posting. I hope you give it a look.